A regional daily has teamed up with a reading charity to launch a literacy campaign on the back of World Book Day yesterday. The Birmingham Mail has joined forces with children’s reading charity Beanstalk, the city’s Adult Education Service and the Library of Birmingham to launch a scheme to boost literacy levels across the city. One in five children in Birmingham is leaving primary school unable to read properly and government figures have revealed that 18pc of the city’s 11-year-olds did not reach the expected standard in their reading tests last year. As part of the campaign, the Mail is urging volunteers to come forward and help youngsters with their literacy. 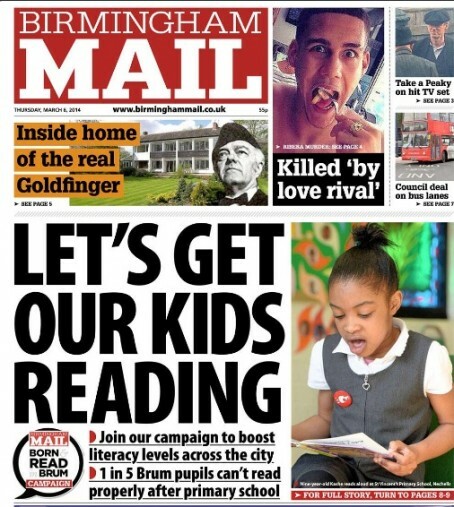 Mail reporter Mary Griffin will be profiling the campaign with tales of Birmingham’s best bookshops, the city’s most loved authors and the schools that are working to get children reading. “Every person in Birmingham deserves the opportunity to read and write,” she wrote in the Birmingham Mail. Around 900 children started secondary school last September with the reading age of a seven-year-old or lower, trailing at least four years behind. “If these children are not supported to catch up with their peers, experts fear they could lack crucial literacy skills for life, not only limiting their job opportunities but also obstructing basic daily tasks such as reading bus timetables, receipts, food labels and prescriptions,” wrote Mary.